Meet Attorney Kaloy. This is the startup story of his business, which gives city exposure to cassava cake, a traditional pasalubong from the provinces. Cassava isn’t exactly the sexiest root crop to build a food business around. But instead of joining the bandwagon of French fries stands and other potato-based food franchises, a lawyer with a deep love of food and Filipino family tradition is out to prove that the humble cassava cake can be a viable franchise business too. 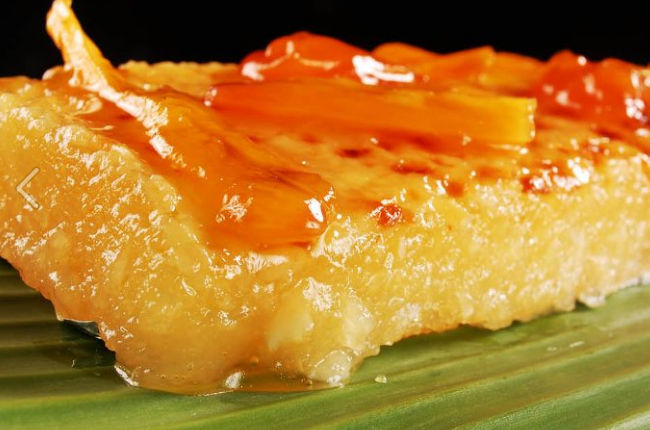 Karlo Benito Cruz is the sole proprietor behind Don Benito’s Cassava Cake, which has been in the market since 2008 but is just opening its doors to franchising. 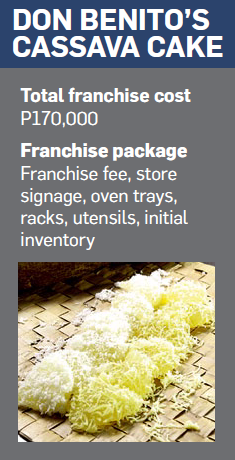 The brand started in Marilao, Bulacan but has grown to more than 25 outlets across Luzon. But seven years ago, ‘Attorney Kaloy’ would have been shocked if he were told his quaint 25 sq m cassava cake stall, beneath the room he shared as a newlywed with his wife Elisa, would be the start of a thriving enterprise. The stall was a wedding gift from his father—whose name is the brand his son chose for the business—and also for finishing law school and passing the Bar. Cruz’s parents were meat vendors in their native Calumpit, Bulacan, and it is from his parents and grandparents that the lawyer takes much of his inspiration for going into business. “My grandmother was also an egg vendor, so business runs in our family,” says Cruz, who still works as chief legal officer for the Bureau of Fire Protection regional office in Cebu City. The elder Benito also provided Cruz with the recipe to start his cassava cake enterprise; the son just modified the recipe and packaging of his father’s popular homemade dessert to target a working middle class customer. 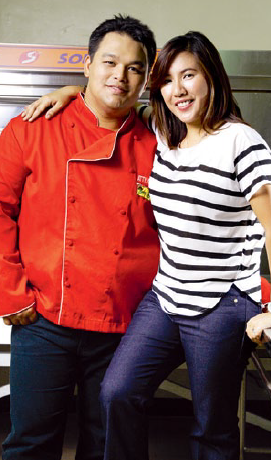 He opened in Marilao partly to avoid competing with his dad’s cassava cake business, which already catered to take-out customers in select cities in Metro Manila. It proved to be a wise move, as Karlo Benito saw his chain of stores grow from three to end-2008 to nine in 2009, 15 in 2010, 18 in 2011, and 23 by end-2012. Apart from its apparently delicious recipe available in four flavors (regular, cheese, langka, and macapuno), Don Benito’s grew on the back of its affordable pricing. From its ‘DonBits’ slices worth less than P30 each to P180 for a rectangular 9-by-10-inch slab, the cakes are cheap enough for a parent’s take-home treat. That Filipino trait of ‘pasalubong’ and the Pinoy’s love for native delicacies are also reasons why Cruz says Don Benito’s outlets are not found in malls; they can be spotted along high foot-traffic areas instead. “We’re in the business of providing happiness,” he adds. “So I’d rather learn of problems from customers firsthand, and make them understand that Don Benito’s is a brand they can trust.” Tell that to a lawyer. This article was originally published in the May 2013 issue of Entrepreneur magazine and was recently updated by the online editor. Subscribe to the print or digital version here.